Russell & Kitty here. Let’s take a ride back in time: It is the early 1970’s and Frank Fenton’s favorite aunt (we have since found out that everyone in Frank’s family was ‘his favorite’) passes away. Frank loved the wisteria stretch compote that was on his aunt’s dining room table or on the buffet in front of a window. She liked to keep grapes and other fruit in the compote that the kids could have during the daytime. The boys did have to be mindful of the compote and not break or damage it. When his aunt passed, her will stated that everything was to go to auction and the money divided equally amongst the heirs. If someone wanted something they could bid on it at the auction. This way she wouldn’t be accused of giving things to her favorites! Would you believe the auction was on a day that Frank had a business meeting that he had to attend? Elizabeth, his wife, had a meeting that she was hosting. Frank’s niece had a test in school. Bill was traveling. Frank left his meeting early and raced to the auction. Would you believe that a couple of people were bidding against him on the wisteria compote! Finally the auctioneer realized what was happening and asked Elizabeth if she wanted to continue bidding against her husband for the compote? Frank stood up and saw her and also his niece in the back of the room. They were all bidding against each other for the wisteria compote for Frank! I believe that the gavel went down at $400. No the local auctioneer was not Randy Clark- Randy was a young boy at that time! No computers in those days, but all of the antique magazines had the story on the front page! Stretch Glass sales went crazy; Farmyard bowls were selling for around $500 at that time. 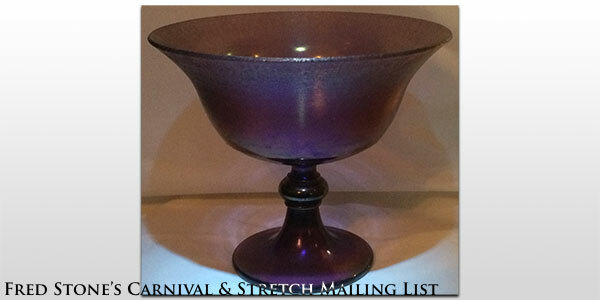 Stretch glass was selling at almost the same amount as desirable carnival glass! The carnival glass world was really buzzing!!! We had just written our book and our book sales went crazy for around a month. Then the stretch glass sales went back to normal. It certainly was an exciting time for stretch and carnival glass people!!! 10 1/4” (high) Standard Compote; no number was given to this compote that is known. The bowl comes in various shapes. The knob on the stem of the compote makes it easy to handle. This is a difficult compote to find. It comes in marigold, celeste blue, Velva rose and the wisteria. We haven’t seen any topaz nor Florentine green, but there could be examples. Have you seen any in these colors or other colors not listed? Brian, Galen, and Kathi how would you report an incident like this in your outstanding price guides? Ardonna thank you for the kind words. We would love it if you could make the next Southern California Convention. We have so much fun. The Open House was heavenly with the beautiful home, but the grounds were out of this world with fresh fruit like lemons, oranges and avocados just hanging on the trees ready to be picked. Ardonna, we do remember your informative talks on “Dragon and Lotus” carnival glass. We learned a lot from you. We do have a sad bit of news. When we started doing the Stretch Tuesday articles, we thought that we would only be doing them during Stretch’s 100th birthday year. We enjoyed doing the articles so much that after the celebration, we just continued along with the articles. We do now have family matters that require our attention so we won’t be doing the Stretch Tuesdays any more or at least for a while. Cal and Dave will be continuing with the Stretch Tuesday articles. We know that you will continue to support them and their hard work for the informative articles. Again thank you so very much for your support. PS A very special thank you to Brian, Galen and Kathi. The three of you are the best! We really appreciate all that you do for us collectors. We will be continuing to read HOC every day.